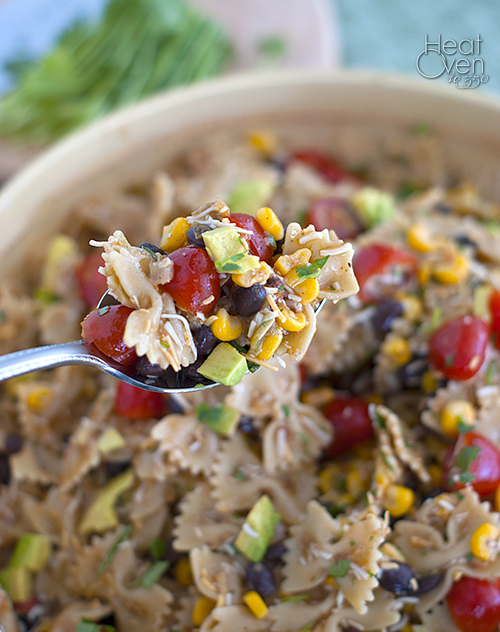 This pasta salad has been floating around the internet for a while now and every time I ran across the recipe I would bookmark it for future occasions because it looks so good and always got rave reviews. That occasion finally came when I needed a fast, easy dinner with plenty of leftovers for lunches because of a busy week ahead. Yes, it's always a gamble trying a new recipe when you know a flop means you're eating sandwiches for dinner and dreading lunch for the next few days, but in this case it turned out beautifully. Dinner was quick, easy, and the salad was every bit as good as it had been hyped up to be. I loved the sweetness of the corn and the slight kick from the salsa. The lime and cumin are wonderful together, and the creamy avocado is, well, creamy avocado. Need I say more about that? There is a great balance of flavors and textures and, being meatless, it was very quick and cheap, too. Yes, this time of year is all about pumpkin flavored treats and soups, but if your taste buds need a change of pace I would definitely recommend putting this in the meal rotation. Cook the pasta according to package directions and rinse under cold water until cooled. 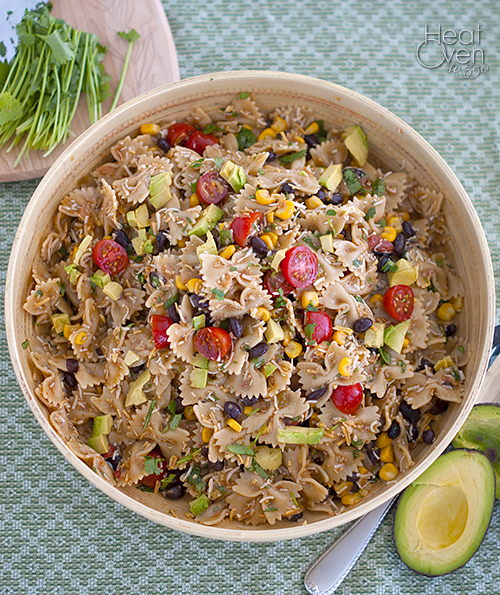 While pasta is cooking, combine black beans, corn, tomatoes, salsa and cheese in a large bowl. In a medium bowl, whisk together olive oil, lime juice, garlic, cumin, chili powder and cilantro. Pour over corn mixture and stir to combine. When pasta has cooled, add to the bowl and mix well. Season to taste with salt and pepper. Just before serving, gently stir in diced avocado. Recipe Source: adapted slightly from a recipe I've seen in a couple places, including Cara's Cravings and The Sweet's Life. I posted a recipe like this a couple 4th of July's ago. It's so yummy! This dish looks amazing, Nicole! I love these flavors, and your photos look incredible. Mmmm...it's got everything in it I love Nicole! Pinning!